Between Cam Newton’s unraveling and Peyton Manning’s brand smooching, you might be having a hard time finding something to be unabashedly happy about in the wake of Super Bowl 50. 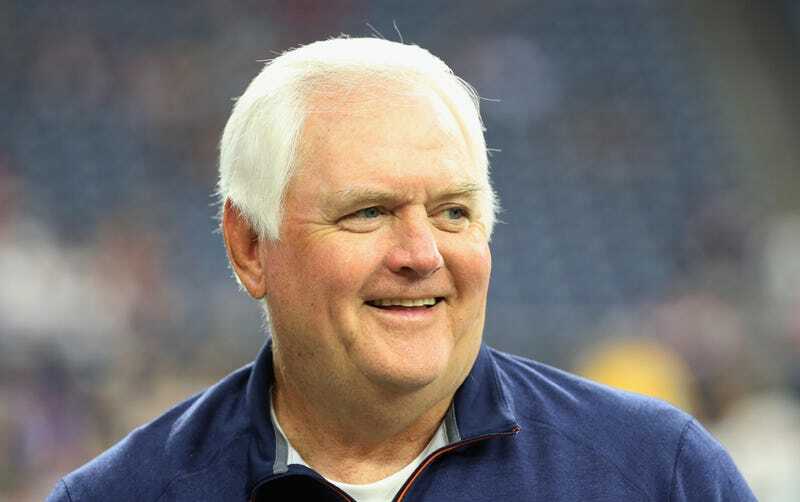 Allow me to submit Broncos defensive coordinator Wade Phillips as a target for adulation. What do you think about when someone says Wade Phillips’s name? The question is easy to answer this morning: he’s the engineer behind the fearsome Denver defense that spent the last month making all-world quarterbacks look like rattled third-stringers. But what about a year ago, when he spent a year out of the league after getting shitcanned by the Texans? You might have remembered him as the overmatched, constantly befuddled-looking head coach who got fired by Jerry Jones after starting the 2010 season 1-7. Or maybe you thought of the guy who was the defensive coordinator and then head coach of those sometimes good but always doomed Bills teams, the guy who watched his best season swept away by the Music City Miracle. How about the guy who was one of the Broncos’ more forgettable head coaches, the one who shuffled off just before the team went and got its first two Super Bowls? The point is that Wade Phillips has been around forever; those stops I mentioned in the previous paragraph only cover the second half of his career. Phillips started his career as an NFL coach since 1976, when he was the linebackers coach for the Houston Oilers, and he’s held a defensive coordinator/head coach position just about every year since. There are a few ways to look at that kind of career longevity in the NFL. It’s certainly evidence of the benefits of nepotism—Phillips first broke into the league by joining his father Bum’s coaching staff—and it can be seen as an indictment of the NFL’s rote and uninspired hiring practices. Raise your hand if you ever thought something like, “How does the guy who looks like a confused old baby keep getting jobs?” upon hearing that Phillips had landed yet another gig. Phillips’s permanently bewildered face doesn’t totally match up with his coaching record, though. He’s a respectable 82-64 as a head coach, and he’s presided over some legitimately great defenses. He’s coached some bad ones, too, but failure will find anyone who sticks around the NFL for 38 years. That brings us to the other way to look at Phillips’s steadfast presence in the league: as a triumph of affable competence. The rigors of the NFL coaching life seem specifically designed to destroy the health and personal lives of those who exist in it. To be a successful NFL coach is to approach the game with the kind of zealotry that leads to 18-hour work days and an eventual transformation into a clinched jaw muscle wearing a headset. It’s no accident that the most successful head coach in the league is a literal goblin. Phillips has never been that guy. He’s always carried himself as a more of a jolly (and sometimes confused) grandpa than a maniacal football genius. He’s the kind of guy who will watch his old team from the upper deck, goof around with reporters, tell you how he’s drippin’, and use Twitter like an actual human being. Maybe these are the reasons why he’s always been a better coordinator than coach—“Not cut out for the grind of being a head coach!” some bloated football talker might say—but maybe that’s not such a bad thing. Phillips spent 38 mostly mediocre years in the NFL grinder, and somehow came out on the other side not only with his personality and sanity intact, but as the mastermind behind a historically badass defense that went out and won the Super Bowl all by its damn self. Wade Phillips reaching this moment of success is like hearing that your sweet uncle Bob went out to take the dog for a walk and ended up at the summit of Mt. Everest, and that’s exactly why it should be celebrated. Phillips is a champion and a seemingly normal human being, and there aren’t many of those in the NFL.